The New Zealand Law Awards were held at The Cordis Auckland last night – revealing the year’s best legal deals, law firms, individual lawyers and legal teams. The event was attended by close to 650 of the country’s top legal professionals, eager to celebrate the big winners across 28 prestigious award categories. TV personality Simon Dallow delighted the crowds in his role as the MC, while great musical entertainment came from singer-songwriters Mark Cunningham and Annie Crummer. Scoring big were multiple award winners Webb Henderson (collecting Boutique Law Firm of the Year and Deal Team of the Year, less than 100 lawyers), Chapman Tripp (scooping up Large Law Firm of the Year and NZ Lawyer Deal Team of the Year, over 100 lawyers) and Anderson Lloyd (winning Legal Personnel Employer of Choice, 51 to 100 lawyers; Mid-Size Law Firm of the Year; and managing partner Richard Greenaway getting the nod for Managing Partner of the Year for firms of less than 100 Lawyers). In-house Lawyer of the Year went to Andrew Cordner of Fonterra Co-operative Group Ltd, while In-house Team of the Year was awarded to the Wellington City Council Legal Team. NZ Lawyer congratulates all of last night’s award finalists and winners. 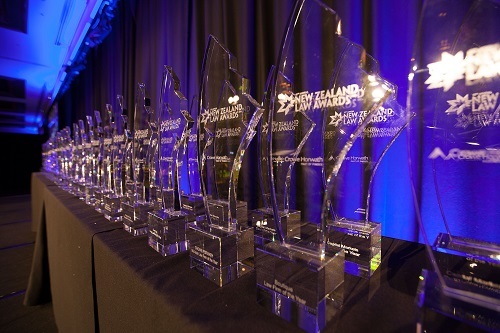 Photos and video coverage from the event will be available next week at www.lawawards.co.nz.